What metrics should I be looking at? What should I be tracking? How often should I look at Analytics? These are some of the all-time greatest questions in digital marketing. There are so many numbers in so many places. Content marketing metrics are confusing, distracting and overwhelming. Is the metric easy to find? Is it available to the public? Do you need tools? Or do you need to do research to uncover it? Is it important? Does the metric correlate with business success? Is it likely to affect financial outcomes? Yes, we went beyond content and marketing, into sales and service. But it all connects back with word-of-mouth marketing (referrals) and reviews (social proof). Some metrics are easy to find; others are hidden. Some metrics are trivial; others are absolutely critical. Now here comes the connection and the irony of marketing metrics. It’s a trap for marketers. 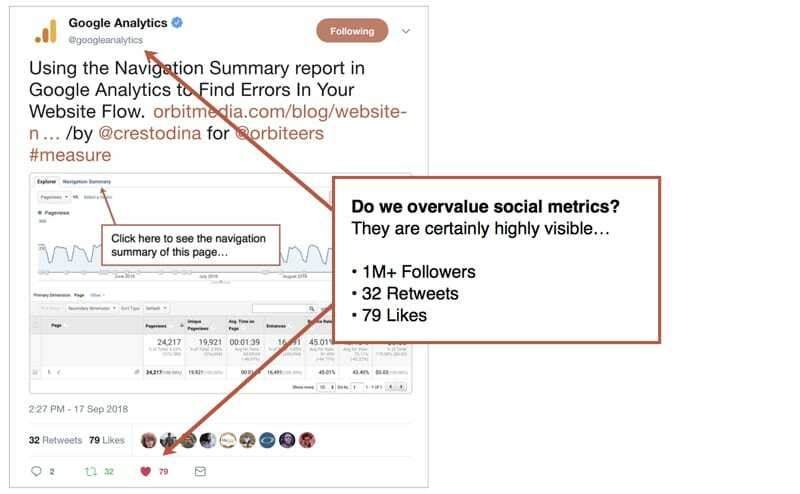 They are often just “vanity metrics” or “ego metrics.” They are often trivial and unrelated to business success. They require tools and analysis. These correlate with business success. I’m calling this Julian’s Law, after my friend and podcast co-host, Jeff Julian. There is an inverse correlation between the visibility of a metric and its importance. You can hear our conversation about this phenomenon on the Explicit Content Podcast. Often, junior marketers aren’t aware of this inverse relationship and they chase the wrong outcomes. Other marketers know what’s important, but struggle to stay focused on the outcomes that matter. So let’s ask the big question: why do we keep getting distracted from the most important data? Combine Julian’s Law with the availability heuristic and you have the ingredients for disaster. Your brain is telling you to place higher importance on the least important data. These metrics are public data, reported on by tools and platforms. These numbers are everywhere. You can see them for anyone. The correlation with business success is weak. A brand could have a lot of Instagram followers but no revenue. Another brand could be great at getting business, but be terrible at getting followers. I’m not saying that social media isn’t important. I love being social online. But we all know accounts with big followings and little business. They may just know how to get a lot of fake followers. Also, the social metrics that are less visible are more valuable. I love that LinkedIn doesn’t gamify the follower accounts. At 500+ they stop reporting. Game over! But LinkedIn connection are of course, more valuable and important that Instagram followers. More important metrics aren’t visible to the public. Here are your website metrics. These are more important, but also don’t always connect to the button line. And within Analytics, Julian’s Law still applies. The easiest to find Analytics data is the least important! These are easy to find with one click. But they aren’t very useful. Consider this: whenever you click on a report on the left, you’re looking at aggregate data. It is the broadest view, which holds the fewest insights. The more you click to the right of the navigation menu, you’re looking at more specific, less aggregated data. This is where the gold is hidden. The more you use segments, filters, advanced filters, secondary dimensions, sorting and views, the more likely you are to find something useful. When you add more configurations to a report, you answer more specific questions and you find more actionable insights. Example: Which of our blog posts do mobile visitors spend the most time with? In some cases, you’ll need to pull the data out of Analytics and do calculations in a spreadsheet. These are called “calculated metrics” because they can’t be answered on a single report in GA. Less visible, but more important! Example: Which of our blog posts converts the great percentage of visitors into newsletter subscribers? Finally, the super important make-or-break-your-business numbers aren’t reported anywhere. You have to dig to find them. Look for clues in your CRM or in your accounting system. You might have to do outreach and surveys. How do you get these numbers? Careful data collection and research. Crunch the numbers. Call the clients. This bottom line connects back to the top line. Happy customers make recommendations and write reviews. Reaching out to clients to see if they are happy is also the best way to get testimonials. A little research at the bottom can power the content up at the top. 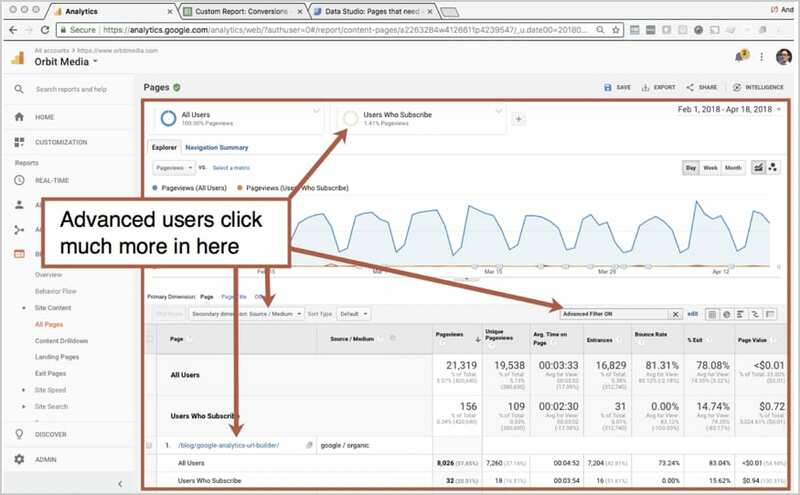 A few weeks ago I wrote a nice little article about how to fix your website navigation using Google Analytics. It’s a great piece. Go read it and come back! A few days later, I look at my phone and Twitter is blowing up. The Official Google Analytics Twitter account shared my article. They have like 1,000,000+ followers. Their post was retweeted 32 times and liked 79 times. Those numbers (1M, 32 and 79) are highly visible, right there in the Twitter stream. Behavior > Site Content > Landing Pages. Drill down to (as in, click on) the URL of the page. Add a secondary dimension for “Social Network” then add an advanced filter to see just the Social Networks that include Twitter. Acquisition > All Traffic > Channels. Drill down to Social Media, then drill down again to Twitter. Add a secondary dimension for “Landing Page” then add an advanced filter to see just the Landing Pages that include the URL. These numbers are less visible, but more important data. Don’t get me wrong, I was thrilled when this happened. I mean, getting shared by Google? Lifetime Marketing Achievement unlocked! I printed the tweet and put it on my wall. I hung it right where my college degree used to be. Then I called my mom and told her what happened. We both cried. If the metric is easy to see, you’re probably putting too much importance on it. Don’t chase famous social accounts. It’s probably a waste to pay an influencer thousands of dollars to share your content. But if you do, dig deeper into your metrics and measure the impact. What metrics really matter in marketing? I listed Domain Authority as one of the most important search metrics. Really, it’s almost a critically i important number for brands that rely on a search strategy. You and I both place big importance on this one. Thanks for the comment, Mardee! Thank you for the excellent article and most importantly thoughts for reflection. I thought about this issue because, in the beginning, I was chasing for traffic, social shares, then comments. But the gut told me something was wrong. If I were selling something or providing services, I would monitor sales. While I’m just writing free articles and newsletter, I decided to track who wrote to me personally. Thank-you emails. Now, this is my most important metric. A lot of us were more focused on the top when we were more junior marketers. The list is also a kind of marketing maturity model. More senior marketers are more focused on the metrics at the bottom. Love this! We all need to get better at measuring what matters. Two additional metrics that are important are Cost Per Acquisition for new leads and Customer Lifetime Value. There are still plenty of businesses that don’t even have estimates for these two. I agree with you fully but take it a step farther by looking for data that’s missing or look for analog clues. Normally we place test orders daily. We got lazy. We usually slow down over the labor day week end but saw no bounce back and realized after placing a test order – account login was corrupted and required repair. No “obvious” data is available to indicate that. Here’s a great vanity metric – 10.2K Quora views over 30 days. I’m doing less and less hard keyword research and telling more stories with video, images and words. Thanks for the great tips! I could not agree more that people tend to place too much importance on likes and followers and not enough importance on the more valuable metrics, such as comments and click -through rate. Andy, thanks for a great post. 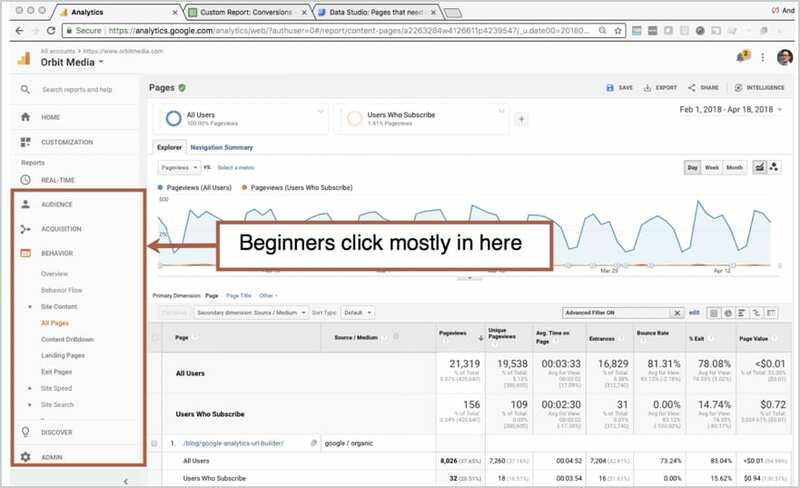 Can you suggest a source of good information or guide that teaches how to create and use all these kinds of reports in Google Analytics?